Dual flush toilets offer the flexibility of choosing how much water to use when flushing waste down the toilet. If you have a minimal amount of waste, you can choose a light flush mode that uses less water. For heavier waste situations, the full flush mode will use slightly more water to flush all waste down the toilet. 2.1 How to Install a Dual Flush Toilet? 2.2 How to Adjust a Dual Flush Toilet Mechanism? 2.3 How Much Water Does a Dual Flush Toilet Use? Dual flush toilets can save considerable amounts of water which is important if you want to be eco-friendly or want to save on your water bill. There are many options available and picking the right product for your bathroom can be difficult. We have reviewed 8 of our top picks for dual flush toilets. Look at our reviews below and see if there are any models that peak your interest! This Woodbridge one-piece toilet is one of my favorite dual flush toilets on the market. It has a water flow rate of 1.0 GPF (gallons per flush) for a light flush and 1.6 GPF for a full flush. This toilet has a powerful flush but is extremely quiet. The toilet seat is at chair-height which makes sitting down and standing up easier for most adults, especially for the elderly or those with mobility challenges. This dual flush toilet is a sleek one-piece design with a skirted trapway. This makes cleaning the toilet simple since there are no crevices or grooves for dust and dirt to accumulate in. The toilet seat has a soft-closing lid with durable stainless steel hinges for durability. Woodbridge offers a 5-year limited warranty on porcelain parts and a 1-year warranty on the flushing mechanism and soft-closing toilet seat. This one-piece toilet is a high-quality durability product and a risk-free choice which will bring you years of long performance. This Woodbridge one-piece toilet has a sleek look that will complement any bathroom decor. This toilet uses a dual flush system with a 1.0 GPF water flow rate for a light flush and a 1.6 GPF water flow rate for a full flush. 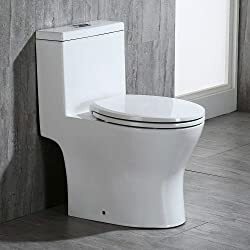 The skirted trapway hides the unsightly pipes and water connections and makes cleaning the sides of this toilet a breeze! There are no grooves, corners or edges to clean around. The soft-closing toilet seat lid has a stainless steel hinge to give you longevity and durability. Woodbridge offers a 5-year limited warranty on ceramic parts and a 1-year warranty on the flushing mechanism and soft-closing lid. This dual flush toilet will enhance your bathroom with its sleek design and quiet flushing performance. This dual flush toilet by Swiss Madison has a sleek design that will enhance your bathroom decor. The fully skirted trapway hides all the plumbing connections and offers you smooth lines for easy cleaning. It has an elongated bowl which gives you added room and comfort. The water flow rate for this dual flush system is quite impressive and eco-friendly. It uses only 0.8 GPF for a light rinse and 1.28 GPF for a more thorough rinse. It has quick-release matte chrome hinges which allows you to unlatch the seat from the toilet easily for more convenient cleaning. The soft-closing lid will prevent the lid from bouncing loudly against the toilet bowl upon closing. Instead it will close slowly and quietly. 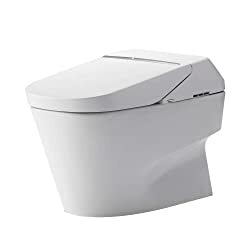 If you are looking for a modern toilet upgrade for your bathroom with dual flush capabilities, consider this Swiss Madison one-piece toilet. It will enhance your bathroom at a budget-friendly price! This HOROW dual flush toilet is a perfect addition for a compact bathroom or small powder room. The seat length is only 16.5-inches and the seat height sits only 16.5-inches above the floor and requires only a small footprint on your bathroom floor. This toilet has a siphon flushing design with two flush options. This gives you the ability to use less water when you require only a light flush. The skirted trapway around this toilet gives you a smooth surface for cleaning without grooves and crevices for dirt to accumulate. HOROW offers a 5-year limited warranty on the porcelain parts and a 3-year warranty on the flushing mechanism and soft-closing lid. This compact toilet is a perfect fit for your compact bathroom! This Kohler two-piece toilet is a dual flush system which uses a left hand nested trip lever to offer a choice of a lighter 1.1 GPF rinse or a heavier 1.6 GPF rinse. It has a round-front bowl making it an ideal solution for compact bathrooms or small powder rooms. Although the toilet seat is not included with this product, you can choose the seat that compliments your style and bathroom decor the best. Kohler offers a 1-year limited warranty on this product. The sleek look of this Toto wall-hung dual flush toilet bowl will give your bathroom a modernized uplift. It will immediately transform your bathroom into a spa-like environment. This toilet bowl appears to float above the floor giving it a futuristic look. The dual flush system uses only 0.9 GPF for a light flush and 1.6 GPF for a heavier, higher volume flush. 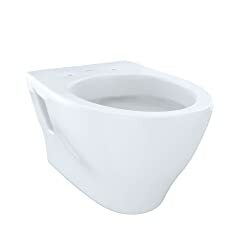 The elongated shape of the toilet bowl gives you more room and makes your bathroom experience more comfortable. 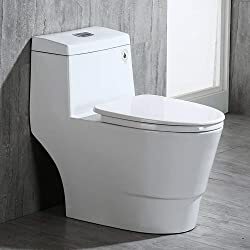 If you have a smaller bathroom or want to give your bathroom a roomier feel, then consider this wall-hung dual flush toilet from Toto. This is a perfect choice for your bathroom remodel or new construction project. You can really set your bathroom apart by adding remote control technology with this Toto dual flush toilet. It features a convenient remote control with a stand and hands-free automatic flush feature. There are many other automatic functions available with this toilet including automatic lid opening and closing. You can keep your seat warm in the winter time by using the temperature controlled heated toilet seat. The dual flush system on this toilet has a water flow rate of only 0.8 GPF for a light flush and 1.0 GPF for a heavier flush. The cyclone siphon jet flushing system gives you a high-efficiency rinse without compromising on performance. This Toto toilet uses the patented eWater+ technology which uses electrolyzed water to sanitize your toilet bowl after each use. If you want to take your bathroom to a whole new level, then consider this Toto Neorest remote controlled toilet. It will transform your bathroom into the future! 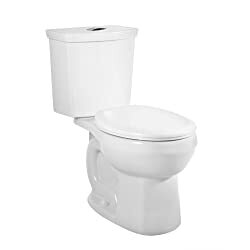 The American Standard dual flush toilet is a water efficient gravity flush toilet. You can use the lighter flush with a water flow rate of only 0.92 GPF or you can choose a full flush and use only 1.28 GPF. The design of the flushing system is intended to be ultra high-efficiency in water savings without compromising on flushing performance. This toilet is slightly higher off the ground than standard toilets giving you seating at the right height for your comfort. American Standard uses an EverClean surface coating that inhibits the growth of stain and odor-causing bacteria. This keeps your toilet clean and gives it a longer brand new appearance. Before you make your final decision on a dual flush toilet for your bathroom, there are a few things you should understand about these types of toilets. How to Install a Dual Flush Toilet? 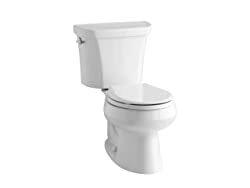 Installing a dual flush toilet is similar to the process for installing a low flow or standard toilet. Although it is easier have a plumber install the toilet for you, it is a job you can do yourself. To avoid extensive plumbing rework, take detailed measurements of your existing toilet configuration and be sure to get a replacement dual flush toilet that will work with those measurements. Before you do anything else, turn off the water supply! 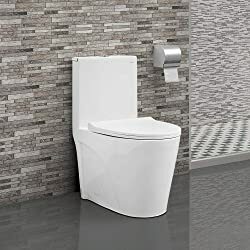 If you are replacing an existing toilet, remove all water from the toilet, disconnect the toilet’s supply hose, remove the old toilet and carry it out of the bathroom. Temporarily place a rag in the floor drain to prevent any gases from leaking out into the bathroom. Next, install the wax seal or gasket for the new dual flush toilet. Install the offset collar or adapter to the flange. This is the connecting fitting that connects the toilet to the drain line. Remove the rag from the floor drain. Set the toilet in place and attach any necessary bolts. If you have a two-piece toilet, install the rubber gasket for the new water tank and attach the tank to the bowl. Connect the water supply hose to the new toilet. Do not forget to check the level of the toilet. Use a shim if necessary to make the toilet level before you seal around the base of the toilet with a silicon seal. Reconnect the water line and turn on the water supply. Congratulate yourself for installing a new dual flush toilet! How to Adjust a Dual Flush Toilet Mechanism? Lift the tank lid off of the tank and place it upside down on a flat surface such as the floor. Be careful to not bend or damage the two rods under the tank that connect to the push buttons. Locate the float adjustment screw between the fill valve and the flush valve. Have a flat-head screwdriver available for making adjustments to this screw. To raise the water level to the indicator line on the inside back of the toilet tank, turn this float adjustment screw clockwise with the screwdriver. To lower the water level, turn the float adjustment screw counterclockwise. Place the tank lid back over the tank and test the flush buttons. Be sure the water usage for the light flush is adequate. The water usage for solid waste should be strong enough to flush away all waste remaining in the toilet. How Much Water Does a Dual Flush Toilet Use? Many years ago, toilets used anywhere from 5 to 7 gallons of water per flush. Older toilets were focused on performance rather than water efficiency. Now, dual flush toilets are designed to conserve water when you only have liquid waste that needs disposed. The industry standard is now at 1.6 GPF. Many toilets now have a siphon or a gravity flush process that use less water but give you the same performance of the older 5-7 gallon flush cycles. Some dual flush toilets have light flush modes that use only 0.8 GPF. This not only reduces the amount of water consumed from flushing, but it also reduces the amount of money coming out of your wallet! Toilets are more efficient now than they have ever been before and dual flush toilets are more cost effective long-term. If you are tired of seeing high water bills and if you want to be more environmentally conscientious, then consider replacing your standard toilet with a dual flush toilet. You wallet will feel the difference and you will give your bathroom a spa-like upgrade at the same time.